Ever wondered how to make cookie mix in a jar? I have seen these mason jar cookie recipes in stores lately, and they are really cute, especially when they are finished off with a ribbon and handmade tag. But I could not bring myself to buy any of these, as I knew they had to be super simple to make. Sure enough, I was right! To make mason jar cookie recipes like this, you just need your basic cookie ingredients, a mason jar, and a little bit of time. By taking a few extra minutes to divide and layer your cookie ingredients, rather than mixing them, and then putting all in a pretty jar, you have a an adorable, quick and delicious gift idea. This gift idea never gets old, either! You can make lots of flavors. I like to buy bulk mason jars and make a different cookie flavor every time I make them. Friends and family are always excited to get the latest batch. I add crushed peppermints during the holidays, pink sugar and sprinkles for Valentine's Day,and different creative color and ingredient combos for other occasions. 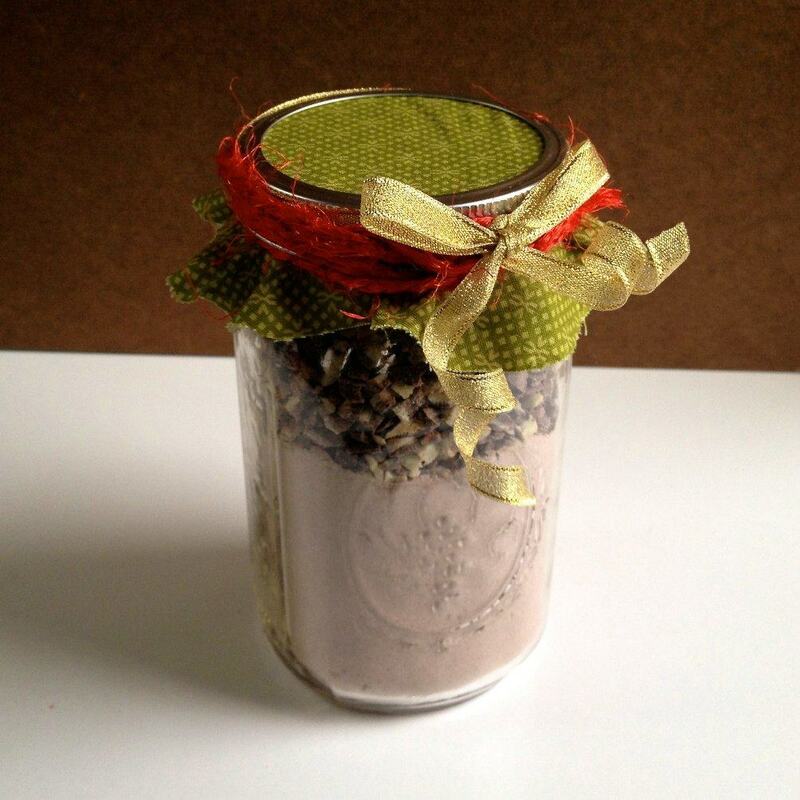 Pour your cake mix into the mason jar. Then, using an ice cream scoop, pack the cake mix in the mason jar. Poor in the mint baking chips. Add a layer of the mint chips to the jar after you have added the cake mix. Cut your fabric and ribbon to the correct sizes. Cut your fabric and your ribbon to fit the top of the jar. • Preheat your oven to 350º. • Combine 1/2 cup of vegetable oil and 2 eggs in a large bowl. • Grab you jar and pour the entire contents in the bowl and stir well. • Place heaping tablespoons of the mix onto a non-stick cookie sheet. • Bake for about 9 minutes.